Invoiced integrates with QuickBooks Desktop out of the box to extend the billing capabilities of QuickBooks. This document describes how to set up the integration and how it works in detail. 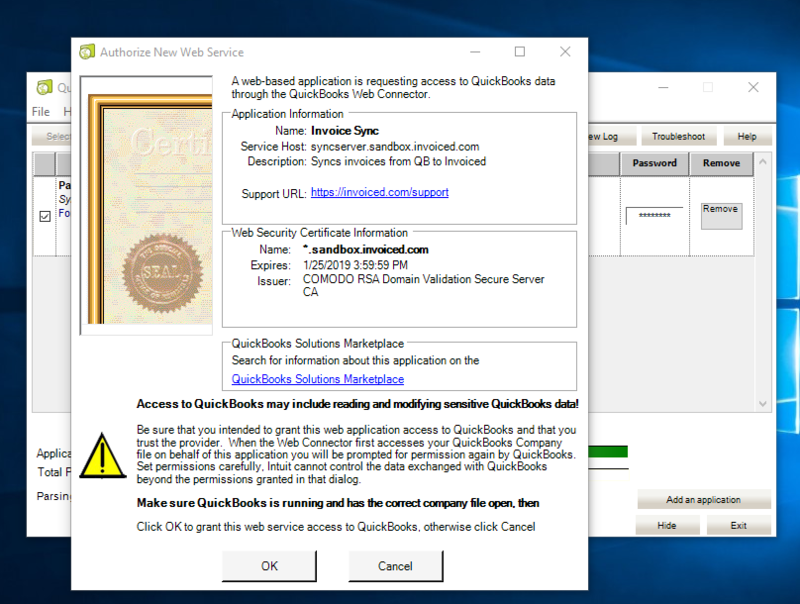 The QuickBooks Desktop integration works with these versions of QuickBooks (Windows only). In order to begin syncing with QuickBooks Desktop first go to Settings > Accounting Sync. Click on Select within the QuickBooks Desktop square. Click on Setup to begin the setup process for QuickBooks Desktop. Install QuickBooks Web Connector on the computer where QuickBooks is installed, if you have not already. 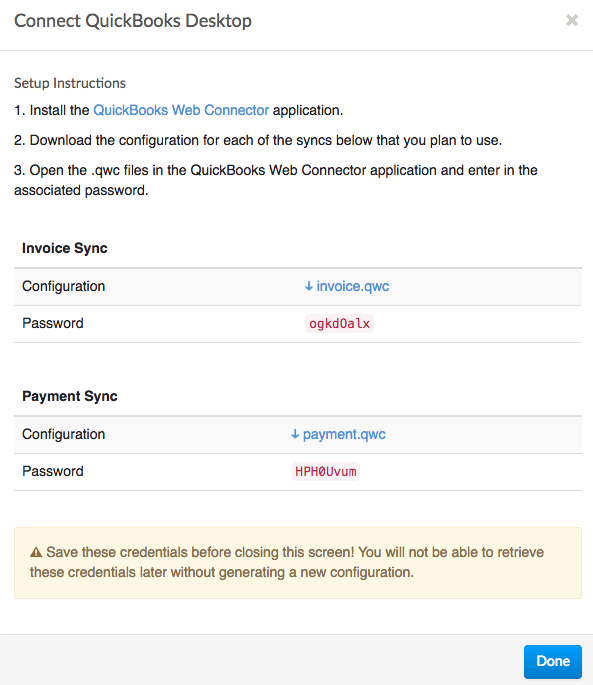 Download the invoice.qwc and payment.qwc files and open the each file in QuickBooks Web Connector. Enter in the generated password for each sync you enable. Make sure you do this before closing the configuration screen on Invoiced because the password is irretrievable once you click Done. In this section you will learn how to use the QuickBooks Desktop integration. These are the steps to run an invoice sync. This will pull in any outstanding invoices from QuickBooks into Invoiced. Close any open windows on QuickBooks associated with the documents that will be synced. 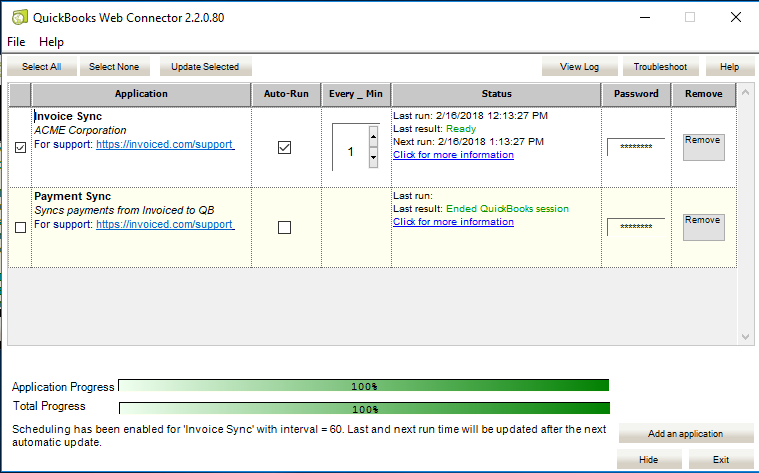 Check Invoice Sync and click Update Selected. When the sync has completed you should see your invoices on Invoiced. These are the steps to run an invoice sync. This will push any payments received through Invoiced into QuickBooks and pull any payments received through QuickBooks into Invoiced. Check Payment Sync and click Update Selected. When the sync has completed you should see your payments on QuickBooks. 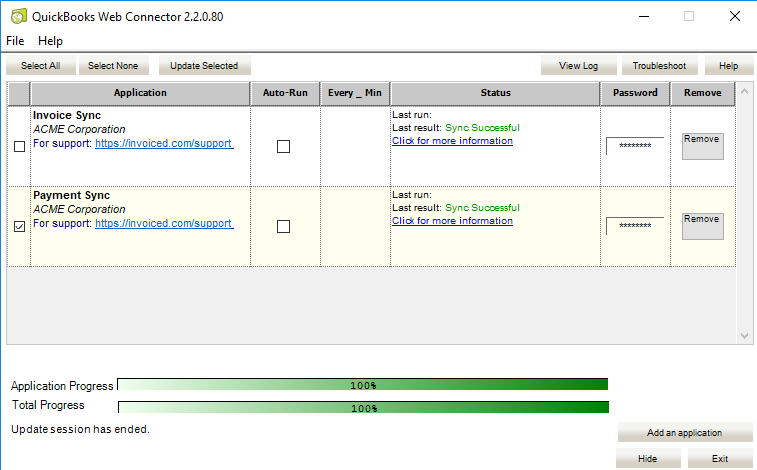 You can tell QuickBooks Web Connector to run syncs automatically by turning on the Auto-Run setting and specifying how often you want the sync to run in the Every_Min box. 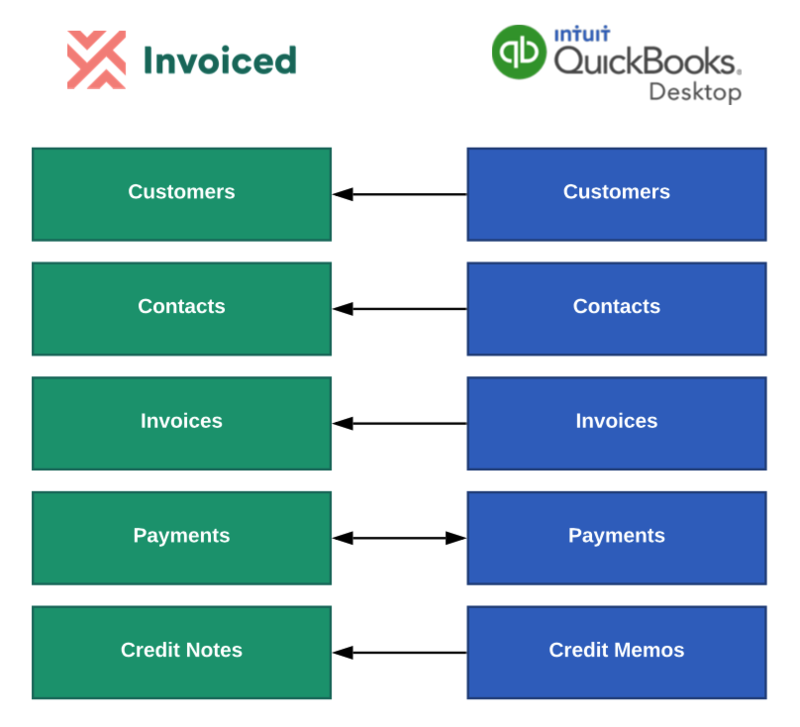 Here we have documented all of the limitations, nuances, and edge cases to be aware of when using the QuickBooks Desktop integration. Any open credits on QuickBooks are applied to the open invoices before importing. Modifications to invoices on Invoiced after they are synced will do nothing to the corresponding invoice in QuickBooks. Only payments processed through Invoiced are sent to QuickBooks. Offline payments recorded on Invoiced are not synced to QuickBooks. Any payments applied to invoices on QuickBooks are synced to Invoiced. Refunds are not currently synced. Any refunds initiated through Invoiced must be reconciled by hand. Please make sure you are connected to the internet in order to connect to Invoiced. Every time you download a .qwc file please make sure you are using the associated password. Each time you generate a configuration this will generate a fresh password. If you are installing a new .qwc file, please make sure that you clear out the old sync first if you are replacing an existing sync.